Written by Kelsey Pecsek on 10 March 2017 . Copperish may have lost a cow in the Open semifinals at the National Cutting Horse Association (NCHA) Futurity, but she has come on with power as a 4-year-old this year. She followed up several strong showings at early limited-age events with an impressive win at The Cattlemen’s Derby & Classic. The Derby Amateur finals may have been small – only 18 horses were entered in the division, so merely five advanced – but that didn’t stop Champions Medal For Honor and John Rockey from putting their best efforts forward. 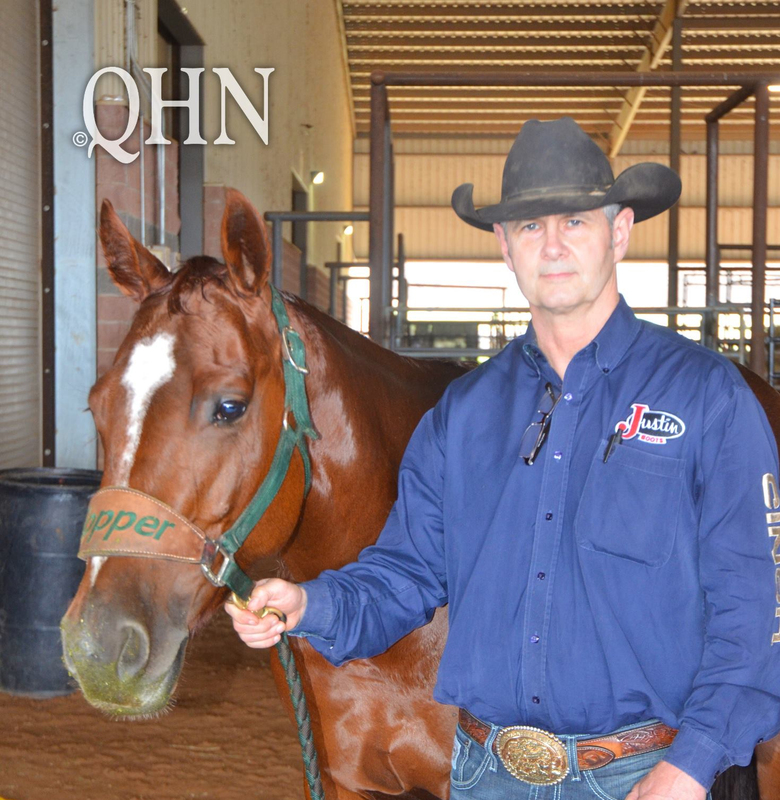 Rockey, of Palmdale, California, rode the Double Dove Ranch-bred gelding (Metallic Cat x Charlies Angel Rey x Dual Rey) to a 218 to win his title and a $3,400 paycheck. That score was also good enough to top the Senior class for an additional $1,260. Medal For Honor is the leading money-earner out of Charlies Angel Rey, who garnered nearly $40,000 in her own cutting career. The gelding is poised to overtake his dam with more than $37,000 in earnings after this win. Rockey boasts almost $120,000 on his Equi-Stat record. The veteran cutter earned his first check in 1985, according to the database. He was recently seen in headlines with Let Georgie Do It (Metallic Cat x Hey Georgy Girl x Wild Thing DNA), who ended 2016 as the NCHA Amateur Horse of the Year. The Derby Amateur Reserve Championship and $2,750 second-place paycheck were awarded to Robert Thigpen Jr., of Chilton, Texas, for marking a 213 on Noodles Brown (Metallic Cat x Jitters Brown x Smart Little Lena), bred by David Brown, of Gainesville, Texas. Madison Crum and Metallictoy did their jobs so well in Graham that they made it back in both the Classic Unlimited Amateur and Classic Amateur finals. In the Amateur, they managed to best their 10 competitors for the Championship, worth $2,500. From Weatherford, Texas, Crum went to The Cattlemen’s with just more than $20,000 to her name in Equi-Stat. Thanks to her win and a fourth-place finish in the Classic Unlimited Amateur, she boosted that number by $5,000. Metallictoy (Metallic Cat x Smartlittlelenastoy x Smart Little Lena), bred by Banawien Ranch LLC, of Little Rock, Arkansas, sold to Beechfork Ranch in mid-2012. Since then, the 6-year-old red roan mare has garnered more than $70,000, including her checks from The Cattlemen’s. She is her dam’s second-highest earner behind half-brother Lean On Rey (by Dual Rey), whose lifetime earnings total $157,420.